Ever since the use of epidural analgesia became widespread in the delivery room, giving birth has become more comfortable and the anxiety of women who go to the hospital has been reduced, since they know that, unless a complication arises, they won’t have to suffer from severe pain. However, the technique has continued to evolve and today, thanks to the technological advances in infusion pumps, hospitals now have alternatives to traditional epidural analgesia. We’re talking about PIEB (Programmed Intermittent Epidural Bolus). 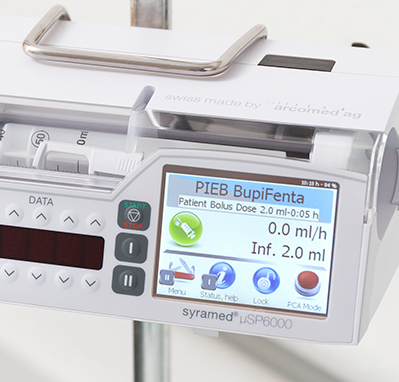 The main difference between PIEB and the traditional epidural technique is that the infusion of the analgesic drug is performed automatically by the infusion pump through the administration of intermittent boluses, whose volume and interval between boluses is determined by the anaesthetist. This technique allows the necessary amount of the drug to be used, dosing it in a much more precise way compared to conventional epidural analgesia, while the patient herself may demand additional boluses or have them be administered manually if necessary. In any of these cases, the infusion pump makes sure the dosing limits are not exceeded and even establishes a block period after the administration of a bolus of medication. The advantages of PIEB affect everything from the delivery itself, during which the patient can have some control over her own pain, to the use of smaller amounts of drugs, resulting in faster recovery times and fewer post-analgesic complications. One of the big advantages of the arcomed Chroma infusion pumps is that a different pump model doesn’t need to be used for the administration of epidural analgesia in PIEB mode. Just connecting the PCA control device, the same pumps that are used for intravenous infusion can be configured in PIEB mode in a simple way, thanks to their icon-based interface (just like smartphones or modern computers) and their high-contrast colour touch screen. This also leads to an economic advantage for the hospital: the pump inventory required to meet all needs is reduced. The arcomed Chroma pumps can perform all the necessary functions, therefore it is easy to move pumps from one area to another if the same pump needs to be used, or they can accompany the patient in their circuit within the hospital. Obviously, this also reduces the need for back-up pumps and storage space for them. At arcomed, we work hard day after day to incorporate the latest technological innovations. The arcomed Chroma pumps are the result of this hard work, which is carried out in close collaboration with clinical professionals in order to make the future of infusions a reality for hospitals.